Why is Christmas such a magical time of year? I think its because everyone is expecting a miracle at Christmas. Consider all the popular movies. Each one has a miracle as it's central plot. Whether it's a boy hoping his parents get back together, a shop-owner hoping he can keep his business running, or a town who needs a new hero to help "save Christmas." You might be reading this and wishing for your own miracle this Christmas. It's probably much smaller than what makes a holiday movie. But it no less important to you. Maybe you're hoping our prodigal comes home. Maybe you're wishing for a job. Some are yearning for a special someone to sit next to you by the fire. 2,000 years ago, there was a couple who hoped for their own miracle. But like many, they had long given up on this dream. Zacharias and Elisabeth prayed for a child, but year after year, that prayer went unfulfilled. So, they gave up on the dream. But this couple didn't give up on God. They stayed faithful. Then, one ordinary day, the extraordinary happened. Zacharias, a priest in Israel, was chosen to give the incense at the altar. This was a once-in-a-lifetime chance, a rare honor for such a common man. Then, as he performed this sacred duty, an angel of God appeared, breaking God's 400-year silence with Israel. The angel told Zacharias that he and his wife, Elisabeth would have a son after all. He would have a special purpose an would prepare Israel for the coming of the Messiah, Jesus. This all sounded impossible to Zacharias. Not the miracle itself—that Jesus would come, that John would be the forerunner. Zacharias, as a believing Jew, knew the Scriptures and believed this. He just had a hard time thinking God could use silly old him. After all, he and his wife were well past the child-bearing age. But, true to His word, God performed this miracle in the lives of Zacharias and Elisabeth. You know the rest of the story. John the Baptist led revival in Israel and would later baptize Jesus Christ, the very son of God. But let's focus on Zacharias and Elisabeth. They were faithful people in a time of unfaithfulness. And yet they had given up on the dream God had planted in their hearts—the dream of having a son. What's interesting is that Zacharias had no problem with the big miracle: God sending a Son to be born of a virgin and be the Savior. It was the little miracle he had trouble with, the miracle in his own life. Even though God had done a similar thing in Sarah and Hannah and Rebekah and Rachel, Zacharias refused to believe his wife, Elisabeth could bear a child. He did something we often do. We believe in the big things of God—sending a son to be our Savior, Creation, Heaven—but when it comes to littler miracles, we limit Him. It's as if we say, Yes, God can create the earth in six days, be born of a baby, and send us to Heaven, but He can't possibly change me, fix a relationship, get me a job. And God's answer is Yes I can. You see, the biggest miracle has already been done—Jesus. Everything else is small to God. So maybe today, like Zacharias, you're letting God know that there is something too big for Him. Something even He can't fix. And the story of Zacharias tells us that there is nothing too hard and that God is still in the business of doing miracles. Even in your own life. Christmas at my house meant preparing for the worst. The worst didn’t always come, but you couldn’t be too careful. You see, the thing about holidays is that people tend to be together, pushed into the same room by tradition and baked turkey. My family spent most of the year avoiding such things, as we hurried off to school or work, buried ourselves in music and books, and generally enjoyed the comfort of a closed door. We could usually navigate the raging Scylla and Charybdis of Thanksgiving because it only meant a day together before we scattered again. But while we chewed stuffing, my father would chew on his disappointment over his life and his family. My older brothers would try not to notice. The tryptophan made us all too sleepy for much more—at least, that’s what I like to think. But then Christmas came lumbering into the UpChurch household with all its vacation days. We had too much time off, and too many unspoken issues. We were like a pot of boiling potatoes with the water sloshing out on the stove. There’d be some sizzling over a lack of job, a splash or two over how much something cost, and then boom… the lid blew off. An hour and two new holes in the wall later, we surveyed the wreckage of the yuletide cheer. My brothers would fume back into the basement, my father would escape to his computer, and my mom would try to figure out what to do. Usually, the anger just sunk back into the pot for another year. When I moved out of my house, it took years for Christmas to reclaim its festive atmosphere. Even when the war ended, the shellshock didn’t. There were too many things unsaid, too many things not dealt with. The embers of home-fought battles wouldn’t die down. Describing salvation couldn’t be better summed up than in those two words set apart in their own paragraph: then, Christ. There was no choir of angels singing (audibly to me, at least) or a special star shining light down on my apartment, but it was a moment that clearly separates time into two epochs. That separation is for both BC/AD and OJ/NJ—Old John and New John. As this New John, though, I noticed something that might as well have been as miraculous as angels breaking out the tunes over my head. When Christmas came, the dread didn’t. I’d plucked the Christ off Christmas, and the mass didn’t seem so heavy. In fact, I even looked forward to it. No, the tension didn’t suddenly melt away. The tempers weren’t all snuffed out. There were still moments that stretched tightly across our gatherings. But I now knew something just slightly flip-the-world-upside-down, mind-blowingly awesome: A baby, born poor and away from home, had taken the worst this world had to offer. A king wanted Him dead, and His country had no place for Him. But still He came… for me. Intersecting Faith and Life: Christmas has no shortage of strains. It’s a holiday that seems perfectly designed for stress—at least, in the way we Westerners celebrate. Family tension has a way of bubbling up with the egg nog, and old arguments never seem to die. But my prayer is that you aren’t afraid to face the day, and not just face it, but be filled with the mystery of it all. Here is a day to remember our God adding humanity to deity and giving up the sweet spot in heaven to plop Himself into our world. He came because He didn’t hold our sin against us; He wanted to hold it for us. And when you keep that perspective, family arguments and stress suddenly seem trivial amid the menagerie of hams and yams and red velvet cakes. 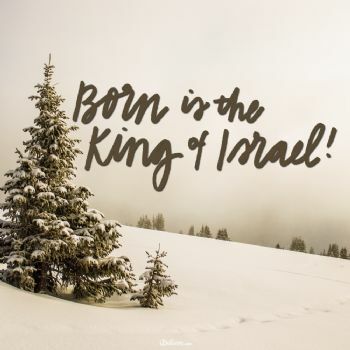 "Where is He who has been born King of the Jews? For we have seen His star in the East and have come to worship Him." The very word "Christmas" has been emptied of its meaning, drug through the gutter, and given back to us, minus its power. Some prefer to use the more politically correct terminology at this time of year, like "Happy Holidays," "Merry Xmas," or even "Happy Winter Solstice." But I actually think those things are not as bad as the person who says, "Merry Christmas" with no idea whatsoever of what Christmas really means. I think we should cancel the version of Christmas that is filled with hype and endless activity leading to exhaustion, the version that gives little to any thought of Christ. We should cancel Christmas and instead celebrate the birth of Jesus Christ. I still believe in Christmas, but not in the holiday as our culture celebrates it. I believe in the real message of Christmas, which is the birth of our Lord. Maybe you are bracing yourself for a tough Christmas. Maybe you think Christmas won't be as good this year as it was before. But what if this Christmas were better than any Christmas you have ever experienced, because you have been freed from the pressure of having to get stuff? That could be a really good Christmas. It could actually be the most wonderful Christmas of your life. The primary message of Christmas is this: God is with us. Isaiah 7:14 tells us, "Therefore the Lord Himself will give you a sign: Behold, the virgin shall conceive and bear a Son, and shall call His name Immanuel." Immanuel means, "God is with us." So the message of the season is not, "Let it snow" or even, "Let us shop." The real message of Christmas is, "Let us worship." That is what the wise men came to do. And that is what we should be doing as well. Christmas is spelled L-O-V-E. What is the Christmas message? John 3:16. God gave us the gift of love on Christmas Day. It is truly said, “What the world needs now is love.” I need it. You need it. Your spouse needs it. Your child needs it. An elderly man or woman sitting alone in a nursing home today needs it. A child abandoned and alone in a children’s home needs it, too. God sent His one and only Son as the Savior. He knew we couldn’t save ourselves. So He sent His Son to be born in a manger, to die on a cross, to rise again into glory, and to come again to redeem His church. Where are you spending your Christmas day? Maybe you can spare a few minutes with your family and friends to share His gift of love with someone who is all alone today. “But to all who believed him and accepted him, he gave the right to become children of God” (John 1:12 NLT). Turn on your television or surf the web this Christmas, and you’ll discover all sorts of Christmas messages. But for the One who invented Christmas, there’s only one message that really matters. That’s the great news of Christmas. This offer is available to anyone. The Bible says of Jesus, “But to all who believed him and accepted him, he gave the right to become children of God” (John 1:12 NLT). God wants to spend eternity with you, so he made the way to him simple: You believe, and you receive. You believe that Jesus Christ died for your sins, and you receive him into your life. God sent his Son to Earth 2017 years ago to die for you. That’s God’s very first Christmas gift, sent to you thousands of years before you were even born. Honestly, celebrating Christmas and not receiving the number one gift God has for you is dumb. Do that, and you’re missing the point entirely. Acts 10:35 says, “It makes no difference who you are or where you’re from — if you want God and are ready to do as he says, the door is open” (The Message). “Dear God, I know that when I die I’m going to give an account of my life to you directly. I confess I have ignored you. I know I have sinned against you, and I have lived by my plan, not yours. I want that to change, starting right now. I want to turn away from my sins toward you. Thank you for sending Jesus to die for all that I’ve done wrong so that I don’t have to pay the penalty. I know that I don’t deserve your forgiveness. I know that only your grace can save me, Lord. I could never be good enough to get into a perfect place. Jesus, thank you for loving me so much that you took all my guilt on yourself. You made me acceptable for heaven, and I humbly ask you to save me. I ask you to save me from the sins and the habits that are messing up my life right now. I believe in you, Jesus. And I believe that you will keep your promise to save me instantly and certainly and completely and eternally. In Jesus’ name. Amen. And that is who He says I am. Today as we continue to see those elements of salvation that Christ's birth has brought, we do so by asking the question, "How close can someone get to Christ and His gift of Christmas and not be saved?" The answer is sadly that you can get very close. Missing Jesus and His salvation is seen most vividly in the story of Christmas. Those closest to the coming of Christ were most untouched by it! In both Luke and Matthew's record we find that you can grow up in the shadow of God's Temple, hear God's Word every day of your life, meet the Wise men themselves, explain the Old Testament to them—and still miss everything, if it is not inside your heart and mind. Christmas is a time to remember that Jesus came to save us from sin and live within us. Beware of getting so close in every way—but in your heart, to Christ. Beware of being acquainted with Christ but never knowing Him. Webster's Dictionary says that knowledge has three levels: recognition, acquaintance, and experience. Knowing Christ means a personal experience of His grace that leads us to partake of His salvation. How close can you get to Jesus and still be too far away? That is what the religious leaders of Christ's day demonstrate to us this Christmas. So close they got, and yet so far away they remained. It is possible to be as close as them, and yet miss all that Christ and Christmas have to offer. We thank You and praise You today for the miracle of Your Son's birth. Thank You for bringing great JOY to the whole world! Thank You for giving us the assurance that because You came to us in the form of a human, we who believe in Jesus can know with absolute certainty that we'll spend eternity with You. We pray for those who are coping with loving a prodigal and our friends and family members whose hearts are far from You. We pray for those dealing with unemployment and addictions and chronic sickness ... and unending pain and frustrations of all kinds. Thank You, Lord, that You are The Wonderful Counselor and Prince of Peace, even in the midst of our not-so-merry circumstances. Finally, Lord, we ask You to grant us peace. Peace in our homes, peace in our churches, and peace in our hearts, when the world all around us spins out-of-control. Help us to stay focused on You, this Christmastime and always. Thank You for loving the whole world enough to send the greatest gift, Your Son, so that we might truly have a very merry Christmas. Certain verses of Scripture leap to our minds as we draw close to Christmas. In the majestic titles of Jesus found in the prophecy of Isaiah 9:6, we find Him to be everything we need. We find Him not only the "reason for the season" but the name that should be on our lips every day as God puts us in touch with others over the Christmas holidays. Who doesn't need to know the Wonderful Counselor? Who doesn't need to know this One who can offer advice when they are facing a difficult situation? This One who has the answers for their marriage and family dilemmas? Who doesn't need to know the Mighty God? You certainly know people who are dealing with a rebellious teenager or an aging parent or a sick child or an impossible job situation. When was the last time you told them how strong the arms of your God are? Perhaps you need to be reminded of how mighty God is by reading Isaiah 40.
Who doesn't need to know the Eternal Father? Who doesn't need the sense of hope that comes from knowing that—although we may suffer for a while—we have a God who dwells in eternity, which means that there is more to life than what we see around us? Who doesn't need to know the Prince of Peace? In a culture of road rage and long lines and short fuses, with strained relationships and simmering discontentment, who isn't starving for deeper, more-lasting peace? Who doesn't need to know why even the most desirable possessions and experiences leave them feeling unsatisfied? Who doesn't need a peace that passes understanding? Who doesn't need more of the Prince of Peace and His peace in their home? This Christmas, be watching for people who need to know Jesus for who He is. Which of the above names most needs to be celebrated this Christmas season in your marriage and family? Pray for more opportunities to share Christ's love with others while Christmas has them more open than usual. He then interrupts my life and fills each black corner with Light. His love flows over the pain like a soothing balm and once again, I experience the manger. Once again, He steps into the smelly, unlikely and very ordinary existence that is mine to change everything – everything! Jesus could have come to us in many ways, but He chose to interrupt the very ordinary with the most extraordinary. He could have chosen to be born in a palace. After all, He was a King. Yet His life on earth began in a manger housed in what amounted to little more than a dirty, smelly barn. The simplicity of His birth is one of His most precious gifts to me, and one of my most profound life lessons. I often wish I had been there that holy night when Jesus was born, but then He reminds me that I have my own manger; my own holy moment when God became a reality to me, and I worship Him! Every year I am reminded of the very heart of Christmas -- Emmanuel, God with us. God wants to be involved in the simple, ordinary happenings of daily life: where we go and what we do, the smile we give the harried stranger and the patience we exhibit in the crowd of impatient shoppers, the love that prompts the secret gift and the heart that constantly celebrates His birth through every sparkling light, every beautifully wrapped gift, each special meal, every card, phone call and visit. Join me in this quest to celebrate Him and His birth in everything we do. Have a birthday party for Jesus. Bake Him a huge cake and invite neighbors to join in the celebration. Adopt a family in need. Reach out to the lonely. Look for Him in the crowd. Emmanuel, God with us! Wow! Father, today I celebrate the reality of Your presence in my life. I celebrate Your birth, Your life, Your death and Your resurrection. And as I celebrate, Lord, help me to be “God with skin on” to those in need around me. Open my eyes and let me see them as You see them! I love You. Happy Birthday, Jesus! In Jesus’s name, amen. I pray that your life is filled with God’s peace this Christmas. Don’t let anyone or anything steal your joy. Guard your heart and mind and keep your focus on the birth of Jesus as you begin to prepare for the Christmas holidays. No matter what your circumstances may be, you can celebrate the Christmas holidays because God is with you. How cool is that, I was just referencing that same Scripture in my blog today. Wasn't sure where it came from, thanks! In Dr. Seuss's classic Christmas tale, How the Grinch Stole Christmas, the Grinch suffers from having a small heart. The source of his heart problem is his lack of understanding the meaning of Christmas. As the story goes, the Grinch tries to put a stop to Christmas, but in the end, he comes to understand what Christmas is all about and his heart grows three sizes! This heart change makes a big difference in his life. I'm not sure what Dr. Seuss' intentions were when he wrote the story back in 1957, but it certainly comes across as a Christian parable to me that parallels the change that takes place in a person's life when he or she comes to understand the true meaning of Christmas: the birth of Jesus, God's Son, who was born to save His people from their sins (Matthew 1:21). When the light of the Good News of Jesus dawns upon the heart of a person, God replaces the old heart of stone, with a new, fleshy heart - and a new person emerges. "Welcome Christmas - While we stand - Heart to heart - And hand in hand." It might just make all the difference in the world. We celebrate Christmas because of the power Jesus brought to change our hearts. Give an example of a time when you changed your mind about something. How did the words or actions of others influence your change of heart? Towards the end of the story "How the Grinch Stole Christmas," what happened that caused the Grinch to change his mind about Christmas? What lessons might we learn from the story? How has understanding the true meaning of Christmas made a difference in your life? How the Grinch Stole Christmas. Then, using the content above, lead your family in a discussion about how Jesus has the power to change our hearts. One thing I love about this time of year is the traditions we have in our family. One of them is sitting down to watch the Jimmy Stewart movie, It’s A Wonderful Life. You may have seen it, but it’s about this fellow named George Bailey who grows up in a small town and has great dreams and aspirations of seeing the world and making lots of money. But through a series of circumstances that he couldn’t control, George never could get out of that little one-horse town. Every time he tried, something happened to keep him there. And to top it off, through a mistake one day it appeared that he would be sent to jail. He was ready to end it all when an angel came to show him what the world would be like if he’d never been born. And George Bailey came to understand that even though he didn’t get to achieve his dreams, he did have a wonderful life that impacted many more people than he realized. I’m convinced there is a little George Bailey in all of us. We want to achieve significance on a huge scale and often forget the small ways that our lives have deeply impacted those around us. Thank God for where He’s placed you and the people you’ve been able to impact. And one day when you meet the Lord, you’ll realize you really did have a wonderful life. THANK GOD FOR THE LIFE YOU’RE LIVING AND IMPACT OTHERS HE’S PLACED AROUND YOU! This passage talks about stumps and shoots. We have several big oak trees in our yard and when one of them started endangering the house, we had it cut all the way down to a stump. A few months later? New green shoots with glossy green leaves began growing right out of that stump. That’s the picture that the prophet Isaiah uses. Seven hundred years before Jesus was ever born, Isaiah prophesied that a Messiah would come from the root of Jesse. Jesse was the father of King David, an ancestor of both Mary and Joseph. While nearly all of King David’s royal line would be wiped out, God promised a Messiah would come from the stump of Jesse. Out of what looked like a dead royal line -- when a pagan, Roman government rather than a Hebrew king ruled over Israel -- God brought about that new shoot: the Messiah – Jesus. Jesus, didn’t rule like King David with an earthly palace or majestic throne or royal robes conquering enemy nations through a mighty army. Instead, Jesus came in poverty and humility, to reveal a heavenly kingdom and to conquer the curse of sin through his own death. O Father, we praise you that before the foundation of the world You chose Jesus, our Messiah, to come to earth and show us the Way to the heavenly kingdom and to be the Way to the heavenly kingdom. We thank you for making room for us who are redeemed in Your heavenly Kingdom. Jesus, we worship you as King of Kings and Lord of lords. You are my King. You have rule over my heart and my life, my thoughts and time and goals. I bow to You only and give you full and free reign over my life. Help me not to grip anything so tightly that I am unwilling to release it to You. You are a just King; our Prince of Peace. Help me to desire Your kingdom above that of my own making and bow to Your will above my own. Holy Spirit, lead me in the ways of the heavenly kingdom. Teach me wisdom from above and guide me in truth. Help me to have eyes that see and ears that hear all that God has for me. Help me to know the Lord, to fully understand His might, to fear turning away from Him and to know His grace. We love you Lord. With all of our heart, all of our soul, all of our mind and all of our strength we love you. We lavish you with our worship. We come to adore You today. Amen. *adapted from Countdown to Christmas: Unwrap the Real Christmas Story with Your Family in 15 Days. Bethlehem is scarcely worth counting among the clans of Judah, yet God chooses to bring his magnificent Messiah out of this town. Why? One answer is that the Messiah is of the lineage of David and David was a Bethlehemite. That's true, but it misses the point of verse two. The point of verse two is that Bethlehem is small--not that it is great because David was born there. (That's what the scribes missed in Matthew 2:6). God chooses something small, quiet, out of the way, and does something there that changes the course of history and eternity. God chose a stable so no innkeeper could boast, "He chose the comfort of my inn!" God chose a manger so that no wood worker could boast, "He chose the craftsmanship of my bed!" He chose Bethlehem so no one could boast, "The greatness of our city constrained the divine choice!" And he chose you and me, freely and unconditionally, to stop the mouth of all human boasting. This is the point of Romans 11 and this is the point of Micah 5. The deepest meaning of the littleness and insignificance of Bethlehem is that God does not bestow the blessings of the Messiah--the blessings of salvation--on the basis of our greatness or our merit or our achievement. He does not elect cities or people because of their prominence or grandeur or distinction. When he chooses he chooses freely, in order to magnify the glory of his own mercy, not the glory of our distinctions. So let us say with the angels, "Glory to God in the highest!" Not glory to us. We get the joy. He gets the glory. Excerpted from "From Little Bethlehem Will Come a Ruler in Israel" by John Piper. © Desiring God. Website: desiringGod.org. Children get excited at the coming of the season, and often we might feel a bit of a charge through experiencing their amazement, but the chores we go through to provide that for them are often the very things that rob us from knowing the wonder for ourselves. Plan the party, trim the tree, max out the MasterCard, wrap, ship, take a trip. And that's assuming we aren't one of the multitudes who find themselves with a case of the Holiday Blues. So if Christ's coming into this world offers hope, and hope, as the song says, provides a thrill, how do we locate that experience amid the distraction and disillusionment of December? Well that's the cool thing about Hope. Just as total darkness can't hold back the light of a tiny flame, so does even the smallest increment of Hope provide joy and purpose. Faith is the assurance of things hoped for, the conviction of things not seen" (Hebrews 11:1). Notice the parallel between "things hoped for" and "things not seen." Talk about a paradox; try applying "assurance" to something your five senses can't detect. It's a challenge. The plus side is that hope, through Christ, is available to you no matter what you see, hear, or feel. It's above your circumstances. "We also exult in our tribulations, knowing that tribulation brings about perseverance; and perseverance [brings about]proven character; and proven character [brings about] hope; and hope does not disappoint because the love of God has been poured out within our hearts through the Holy Spirit who was given to us" (Romans 5:3-5). "Hope is not what you'd expect; it is what you would never dream. It is a wild, improbable tale with a pinch-me-I'm-dreaming ending… Hope is not a granted wish or a favor performed; no, it is far greater than that. It is a zany, unpredictable dependence on a God who loves to surprise us out of our socks and be there in the flesh to see our reaction." "Love… hopes all things…but now abide faith, hope, and love; but the greatest of these is love" (1 Corinthians 13:7,13). Ever wonder why faith, hope, and love are the greatest virtues, and apparently in that order? Maybe hope isn't actually something we do, but something we receive, like grace. If it's true that "without faith it is impossible for us to please Him" (Hebrews 11:6), perhaps it's conversely true that without Hope it would be impossible for Him to please us. The same verse says that God is a rewarder of those who seek Him. Is hope that reward? I mean, if faith is what we give to God, and hope is what He gives to us, then we have the dynamic of a relationship. With that in place, we can love. So love is built on hope, which is built on faith. For hope to exist, unfortunately it looks like there has to be hopelessness first. A perfect world wouldn't have any need of hope. Deliverance arrives undeservedly and perhaps unexpectedly, just as in the unlikely way God came to earth to provide a once-and-for-all substitute for the sins of all men on the first Christmas. That's why things can look bleak, but that's where hope lives. The good news is: you simply can't hope big enough, which goes back to the idea of our minds and senses being inadequate to judge God's design and methods, and hope being more a function of God's involvement than our desires. I readily acknowledge I could not have conceived of the plan of salvation or the virgin birth. I couldn't have imagined the plan for the walls of Jericho to crumble, for hungry lions to turn into Daniel's pet kittens, or the Red Sea to part and offer up dry land. So neither do I know how my problems will be solved, or what miracles I'll be blessed to see this Christmas. Isaiah 9:6-7 concerns the hope of the prophecy being fulfilled that brought us a "Wonderful Counselor, Mighty God, Eternal Father, and Prince of Peace." The last sentence of verse seven says it's "the zeal of the Lord" that will accomplish this. God is excited! He's zealous (enthusiastic, passionate, obsessive even) to bring us this hope! Romans 15:13 is my Christmas prayer: "May the God of hope fill you with all joy and peace in believing, that you may abound in hope by the power of the Holy Spirit." Why is there hope? Because Jesus was born. O holy night. What a thrill. God is at work. What does hope out of despair look like? There are lots of examples in any Christian's life, but in terms of contemporary cinema, I know of no better example than the Lord of the Rings trilogy. Go back and watch those movies again over the holidays, keeping an eye out for allusions to hope and hopelessness. Judith. Always nice to read from you after a long hard day. When Pope Julius I declared December 25 to be celebrated as the birthday of Jesus in A.D. 353, who would have ever thought that it would become what it is today? And when Professor Charles Follen lit candles on the first Christmas tree in American in 1832, who would have ever thought that decorations would become as glamorous as they are today? Even before these two events that shaped what Christmas means today for most, there was a bright, special star that lit the dark night thousands of years ago letting the world know that Jesus the King was born. Usually, we don't celebrate historical figures as children, but in the case of Christ, it is appropriate. When Christ was born, shepherds came to honor Him, wise men from the East brought Him gifts, and the earth rejoiced at His birth. These people who came to worship Him had no idea what Christ would accomplish as an adult. But they were right in traveling to worship the King because His birth was the most remarkable event in human history. Wise men and women today worship not only the Child of Bethlehem, but the Christ of Calvary. As we approach the holiday season again, we are faced with yet another opportunity to pause in the midst of all the excitement, decorations, and commercialization, to consider again the origin of Christmas--the One whose birth we celebrate. Let's not forget the true meaning of why we celebrate during this time of year. Celebrate the baby Jesus and trust Him as Savior today. PRAYER CHALLENGE: Thank God for sending His Son that glorious night to be born of a virgin, live a perfect life, die on the cross for your sins, and rise from the dead three days later to give you eternal life through Him. I have to be honest, I really do love the holiday called Christmas. Our church is a beehive of activity. Our home is a menagerie of laughter and friends and family. I love the food. I love the decorations. I love the way Christmas smells. And who can argue with a couple of cool presents under the tree with my name on it!? Not a bad way to observe Someone's birthday. So yeah, I’m looking forward to the holiday. It's another day to release my battles and my fears and my self-righteousness. It’s just another day to embrace the incredible love of God and celebrate the reality of His presence in my life. Yes, Emmanuel, “God is with us.” That truth makes every day a celebration!